Biography of Landscape Painter, Founder of Barbizon School. An important figure in French painting of the mid-19th century, the artist Jean-Francois Millet was a founding member of the Barbizon landscape school in France and is best known for his genre-painting and landscape painting - mainly featuring the back-breaking rural life of the French peasantry. His style can be categorized as both Naturalism and religious realism. His most notable paintings include The Angelus (1858, Musee d'Orsay), The Gleaners (1857, Musee d'Orsay), The Sower (1850, Museum of Fine Arts, Boston), and the arresting Man with a Hoe (1860, J Paul Getty Museum, LA). Many of Millet's paintings are available online as prints in the form of poster art. NOTE: For an explanation of how Realism led to Impressionism and ultimately to abstraction, see: Realism to Impressionism (1830-1900). The Gleaners (1857) Musee d'Orsay. One of the greatest genre paintings. Born in 1819, in Greville-Hague, Normandy, his parents were peasant farmers. He was educated under the local priests, but showed such a talent for drawing he was sent to Cherbourg in 1833 to study with the portrait painter Paul Dumouchel. By 1835 he was studying full time with Lucien-Theophile Langlois. In 1837 he received a stipend to move to Paris where he studied at the Ecole des Beaux-Arts under the French academic painter Paul Delaroche. His early works showed strong influences of Nicolas Poussin and consisted mainly of portraits and mythological subjects. However by the late 1840s his subject matter changed, and similar to Gustave Courbet - noted for The Artist's Studio (1855) and A Burial at Ornans (1850) - and Honore Daumier, he started to paint peasants going about their everyday normal life. The Winnower (now lost) was exhibited at the Paris Salon in 1848 and was one of the first rural scenes he painted based on his childhood memories. In 1849 a cholera epidemic broke out in Paris, and on the advice of engraver Charles-Emile Jacque, he moved to Barbizon, near the Fontainebleau Forest, where he was to remain the rest of his life. It was here, that his painting had a huge influence on the Barbizon School. The school was moving towards outdoor realism, or naturalism, choosing to paint from nature directly - a method known as plein air painting - and abandoning the formality of classical painting. Other leading members of this plein air painting movement included members of the school of English landscape painting, such as John Constable (1776-1837) and Richard Parkes Bonington (1802-28), as well as French painters like Theodore Rousseau (1812-67), Camille Corot (1796-1875), Narcisse Diaz de la Pena (1808-1876), Charles-Francois Daubigny (1817-1878), Jules Dupre (1811-1889), Joseph Harpignies (1819-1916), Constant Troyon (1810-1865), Charles-Emile Jacque (1813-1894), Antoine-Louis Barye (1796-1875), Albert Charpin, Felix Ziem and Alexandre De Faux. 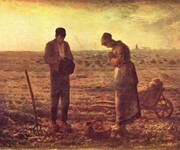 In 1858 Millet painted his famous realist painting known as The Angelus, which depicts a hard working peasant couple taking a break from their toil in the fields to pray. The painting is simple in style and depicts the figures in complete harmony with their surroundings. The work, along with his other peasant scenes, cements Millet's reputation as one of the best genre painters of the 19th century. The Angelus was much copied after his death, and the Surrealist Salvador Dali was so fascinated by it, that he wrote an essay entitled The Tragic Myth of The Angelus of Millet. He was convinced that the 2 figures were praying over their buried child, rather than praying to the Angelus. In fact he was so insistent, an X-ray of the canvas was taken which indeed showed a painted-over shape which looked strikingly like a coffin. However it is unclear whether Millet changed his mind on the meaning behind the painting, or if in fact the shape is a coffin. Later in life his palette tended to lighten somewhat, and as his brushstrokes loosened, he veered towards Impressionism. But, unlike the Impressionists, he never painted outdoors, and he never paid too much attention to tonal values. It was his draughtsmanship and the attention he paid to ordinary people in his works that appealed to artists like Van Gogh (who mentioned Millet's work several times in letters to his brother) and Georges Seurat. Although he was accused of being a socialist, his paintings had an almost religious gloss to them, which made them more acceptable and profitable at the time. Nevertheless, he had a huge influence on other younger artists including Eugene Boudin (1824-98), Claude Monet (1840-1926) and Pablo Picasso (1881-1973). In 1875 he married his partner Catherine, and died 17 days later. A few people are raised to the heights of religious and aesthetic exaltation at the experience of misery. They feed upon sorrow yet transform it into real beauty. 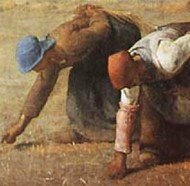 Such a man was Jean Francois Millet (1814-1875), painter of The Man with the Hoe, The Sower, The Gleaners, The Angelus, native of Normandy, child of a peasant and son and heir of poverty. Among the French artists of the nineteenth century he stands out as the patron saint of pessimism, a man who found inspiration in the sadness of human existence. It was in the daily routine tasks of the peasant, for whom the very issue of existence, the very question of life and death was decided by the vagaries of the soil, that Millet found the supreme drama of humanity. The stage for the epic tragedy was the land of Normandy, and the actor was the peasant at work, unceasing, uncomplaining, devout. There was irony and pity in this devotion of the peasant. A spectacle to move an artist to prayers and tears. "Ah, my child," the village priest had told Jean Francois when he was very young, "you have a heart which will give you a great deal of trouble; you don't know how much you will suffer." And Jean Francois fulfilled the prophecy in spades. The critics took his paintings to task for the absence of joy in them. Joy? He knew none. He was a peasant. He had been brought up by a simple, stoic grandmother, by a father who died at an early age of overwork, by a mother who died in sorrow because her son Jean Francois, who was away painting at Barbizon, couldn't afford the railroad fare to her bedside. "The joyful aspect of life never appears to me. I do not know what it is. I have never seen it. The most cheerful things I know are calm and silence." As a young man he had sketched a few charcoal pieces at night after a hard day's toil in the fields of his native home. These sketches had excited the admiration of a third-rate artist who lived in the vicinity. From then on Millet was aware that a farmer's career was not for him. Art was his business, his mission, his very religion. The friendly artist interceded with a committee in Paris to vote him a scholarship. Millet left his home and went to the capital. But as soon as he got there a great longing for the countryside seized him. He had arrived in "black, muddy, smoky Paris," as he called it, one snowy evening in January. The traffic of the carriages, the street lights deluged with fog, the narrow lanes and the dirty hovels sent the tears rushing to his eyes. To check a sudden burst of sobbing he threw over his face handfuls of water from a street fountain. That made him feel better. After all, he was here on a religious pilgrimage. The last words of his grandmother, a stern, stately, chaste Catholic with the soul of a Puritan, now came back to him. "I would rather see you dead, my child, than rebellious and unfaithful to God's commandments ... Remember, you are a Christian before you are an artist." It is precisely this quality in Millet's art that the critics have seized upon. They say that he was more of a Christian than an artist. Take, for example, his well-known oil painting The Gleaners. Three peasant women are gleaning in the fields, mechanically, wearily, under a hot, blazing midsummer sun that scorches the land with its devastating rays. In the background a group of harvesters pile up the golden grain. A farmer, mounted on a wagon, supervises their work. Two of the women gleaners, dressed respectively in red and blue kerchiefs, are bent over, fumbling with their fingers in a dumb, uncomplaining way for the stubble. A third woman stands up to ease the strain, perhaps to wonder, for a moment, what cruel law it is that has condemned her to such suffering and toil. But after this momentary flash of insight, after this partial kindling of the divine fire which promises to turn this clay into something human, it is apparent that she will take her place beside the others and bend her back once more. "In the sweat of thy brow shalt thou earn thy bread." When Millet painted The Gleaners he was forty-three. For many years he had sent his pictures to the salons of Paris, only to be rejected again and again. His work was not palatable to the aristocrats. They would have nothing to do with a man who held the plough and tramped over the soil and the manure of Barbizon. When Millet had joined the art class in Paris the sophisticated, urbane pupils had sneered at his manners. A few of them, more outspoken than the rest, had become acquainted with the strength of his fist. Partly in derision, partly in admiration, they had nicknamed him the Wild Man of the Woods. And the Wild Man of the Woods he remained throughout his life. "I will never be made to bow," he said. "I will never have the art of the Parisian drawing rooms forced upon me. A peasant I was born, a peasant I will die." And so he had settled with his wife and his children in a rambling hut in Barbizon, at the edge of the great forest. He dug and painted in his garden and brought up his family on the barest level of subsistence. He knew the peasants that he painted. He was their brother and a close intimate of sorrow and despair. In spite of the fact that his living expenses were almost negligible, he was unable to meet them. At one time he wrote: "I really don't know how I'm to fulfill my obligations and go on living." There were days when he didn't have two francs in his pockets. It was with a great deal of tenderness that he painted The Gleaners. He was quite familiar with the hardships of tbe French peasant. Yet the public greeted this painting with a chorus of derision. Referring to the figures of the three gleaners, one critic remarked: "These are homely scarecrows set up in a field: M. Millet's ugliness and vulgarity have no relief." To this outburst Millet could have replied that even in things homely there is a goodness which is beyond the comprehension of a blind critic. Some of the critics called in question the technical aspects as well as the spiritual quality of the painting. The field in which the gleaners are working is bathed in a presumably hot, intense August sunlight. Yet the tonal finish is a murky, dull, ashen blue which suggests a haze. One of his defenders, however, explained this, pointing out that "the August sun sheds a powerful warmth upon the canvas. You will not find any of these capricious rays which gambol like holiday schoolboys in pictures by others. This is a grave sunshine which ripens wheat and makes men sweat and does not waste its time in frolics." Millet spent most of his adult life in this "province for painters." He lived in a small barn heated by a wood stove. Twenty-seven years! He had a patient, uncomplaining wife to support. "Grand old woman," he said of her tenderly. And children, "the little toads," with mouths to feed. How hard the winter was to bear when your paintings weren't selling, when you were forever on the brink of starvation. Yet he was not a philosopher. He did not wish to do away with the bitterness of life or to find a formula that would make him stoical or indifferent. Pain is perhaps what gives the artist the strongest power of expression. "Art is not a diversion," he said. "It is a conflict, a complication of wheels in which one is crushed." When The Gleaners appeared he was accused of being an agitator. The bourgeoisie believed that he was trying to make the peasants class-conscious, that he was encouraging a social revolution through his personal hatred of the propertied classes. Hatred? "The mission of art is a mission of love, not of hate," he replied. Was he concerned about the emancipation of the peasant from the soil? He himself was a peasant of the peasants. The idea of the eternity, the timelessness, the divinity of man in his chosen occupation, made him desirous of painting the peasant not as he might be but as he actually was - doomed, pre-ordained to till the soil forever without any dream of, or desire for, a social change. Politics, revolution, socialism? "What has art to do with those things? Art will never come except from some small, disregarded corner where an isolated and inspired man is studying the mysteries of nature." But the critics refused to see. "The three ugly fates of pauperism" - that is what they nicknamed the three gleaners - "the battle cry of Jacobinism and Revolution." "My critics," Millet replied, "are, I imagine, people of taste and instruction; but I cannot put myself into their skins. I have never seen anything in my life except the fields, and I try to tell simply, and as best I can, what I have seen." Theatrical and melodramatic, that is what his painting is, they charged. But melodrama was the farthest thing from the mind of Millet. "The Luxembourg Gallery has given me an antipathy to the theater," he replied. "I have always had a marked dislike for the exaggerations, the falsities and the simperings of actresses and actors." Well, then, at any rate - insisted the critics - he bubbled over with cheap sentimentality; he gushed with the brush! This accusation, like the others, Millet emphatically denied. His own God was Michelangelo, and Michelangelo had once remarked to the Prince of Holland, "Good painting will never draw a tear." How, then, did The Gleaners come to be painted? "Remember, Jean Francois, you are a Christian before you are an artist." That is what his grandmother had told him just before he had set out for the art schools of Paris. "Up, up, my little Francois," were the first words he had ever remembered from her. "If you only knew what a long time the birds have been singing the glory of God." And the last words she had ever breathed remained clearly etched upon his memory. "Paint, paint for eternity, and think that the trumpet which will call you to Judgment is always on the eve of sounding." Jean Francois Millet was a man of religion. In him there was no message of protest, no plea for social readjustment. "In the sweat of thy brow shalt thou earn thy bread." An immovable fate that never will change. He was brought up on the Bible. He saw, in the incessant struggle of man with the soil, a significance not social, not political, but primarily religious. He was a simple and solitary man of God. His entire object was to show the beauty of life in the sad grind of hard labour. Millet loved life for its very sadness. It was the winter in his soul that made him love it thus. His character had been nourished on the Scriptures and on the winds that lashed the seacoast of his native Gruchy. The Scriptures, the sea storms, and the poetry of Virgil and Homer. He read these two ancients assiduously. They were closer to him spiritually than most of his contemporaries. The men and the women that he painted in The Gleaners were not merely subjects for social tracts or mute and inglorious clod¬hoppers, poor, mistreated, miserable creatures of common clay. They were, like the soldiers of Virgil and Homer, heroic characters in a great poem, the greatest of all poems - the Epic of Life. "In the middle of the fields a young peasant and his wife have just finished their day's work. Some sacks of potatoes are loaded upon a wheelbarrow. The mists of the twilight are stealing over the field. Away on the horizon is a village. The steeple of the church and a few cottage roofs are discernible through the gathering gloom. Suddenly the far-off music of the Angelus comes floating on the tranquil air. Silent and motionless, the two occupants of the scene stand lost in religious contemplation. The man, baring his head, stands awkwardly holding his hat in his big, toilworn hands; the woman clasps her's reverently together and both of them bow their heads. How poor and uncouth is their appearance! To look at them, you would think they were both compounded of the soil that clings about their wooden clogs. Nevertheless, in the stillness of the twilight, darkly silhouetted against the fading splendor of the sunset, their forms dominate the scene. The world of nature is melting away into the deepening shadows of the night and ceases to overwhelm them with its immensity. They are no longer two poor, lonely folk, but two souls whose prayer fills the infinite." This painting, not long after Millet's death, was sold for a quarter of a million dollars. But in 1859, when the artist had just completed it, he had reached the very depths of poverty. "We have only enough fuel to last us for two or three days," he wrote, "and we don't know how we are going to get any more; for they won't let us have any without money ... "
This was one of the few rebellious periods of his life. When he had been unable to raise the fare for the visit to his dying mother he had thrown up his hands in despair. "I am nailed to a rock and condemned to hard labor without end!" And now, when poverty once more crushed him helplessly down, he departed for once from his usual objectivity and painted the bitterness of his despair in The Man with the Hoe. He clearly anticipated the sensation that this picture would create. "The Man with the Hoe" he wrote to a friend, "will get me into hot water with a number of people who don't like to be asked to contemplate a different world from the one they're used to, who hate being disturbed out of their serenity." Rarely has a picture occasioned a greater storm of abuse on the one hand, or a more fanatical outburst of praise on the other, than this portrayal of a harassed and hopeless toiler of the fields who pauses for a moment to lean on his hoc. "Bowed down with the weight of centuries," wrote Edwin Markham in the poem inspired by this picture, "the emptiness of ages in his face." The mind of the man has been killed by the generations of hard labour imposed on him and all his class. There is a vacant, meaningless stare in his eyes. All character in his face has been snuffed out. He has been dragged down to the level of the beast. "Certain wild animals," said La Bruyere, speaking of such men, "may be seen scattered over the country, male and female, black, livid, and burnt up by the sun, bound to the earth, in which they poke and fumble with invincible obstinacy; yet they have a kind of articulate speech, and when they rise upon their feet - they show a human countenance, and indeed are men." Critics shuddered at the painful realism of the work. No one before had ever dared to shake this fellow from his obscurity - this peasant with the hoe, back bent, skull elongated like a pear by the long, ceaseless toil, vague, glazed eyes untouched by any thought - dumb, stolid beast of the ploughshare. "Millet must have looked some time before he found such a type," wrote one of the critics in scorn. "Such types are not commonly encountered even in idiot asylums. Imagine a monster with an imbecile grin upon his face, planted all awry like a scarecrow in the middle of the field. No gleam of intelligence gives a human touch to this brutish thing thus taking his rest. Is it work or is it murder he has been doing? Is he turning up the ground or digging a grave?" People saw socialistic propaganda in the picture. The Man with the Hoe was typical of the great masses of agricultural workers who had toiled in the fields of France for ten centuries without a murmur. Had an artist now appeared to give them a voice? Yes and no. For once Millet had put a sermon into his painting. The Man with the Hoe is a patient servant doing God's work in His cathedral of land and sky. "Is the work these men do the sort of futile labour that some folks would have us believe?" he challenged. "To me at any rate it conveys the true dignity, the real poetry of the human race." Yes, poetry, but tragic poetry. The tilling of the fields, the painting of pictures, the writing of hymns - these noble works have to be done. But why such bitter sorrow in the doing? But sorrow did not remain with Millet forever. At last he was able to thrust the wolf from the door. The Sower, The Gleaners and The Angelus had converted a small but influential group of people to the religion of his art. These people were neither baffled nor frightened by his realism. A brother artist, Theodore Rousseau, was one of the first to recognize the genius of this painter of the world's patient sadness. When Millet was going through his struggles Rousseau had bought one of his paintings for a few hundred francs, and to avoid embarrassing him he had pretended that a wealthy American had been the purchaser. Another friend had raised, by means of a raffle, a sufficient sum of money to pay his rent and butcher's bills. Alexandre Dumas wrote glowing articles about his work, and finally a wealthy collector agreed to advance him a thousand francs a month in return for Millet's entire output for a period of three years. A kindly and devoted father, whenever during the day the sounds of the children at play came to their father's ears while he was at work in his studio, he would rush up to them, kiss them and tell them anecdotes. And while he worked his door was never closed. Yet all the children, even the very youngest, lowered their voices and walked on tip-toe whenever they chanced to pass it. "Shhh - Papa is working," they would caution any visitor who was careless about showing the same respect. At night they would all sit around the supper table with tumbled hair and merry faces. Millet, like a patriarch in some ancient saga, sang songs of his childhood on the farm at Gruchy. Complete public recognition came to this patriarch painter in 1867, when he was fifty-three. Acclaimed as one of the best landscape artists for his peasant scenes, he won a gold medal from the Academy of Arts. One year later he received the sweetest gift from the hand of Fate - and the cruellest blow. He was awarded the decoration of the Legion of Honor and he lost his dearest friend, Rousseau. Stricken with paralysis, this "more than brother" died in his arms. For six more years he created beauty, and then he too went to his Sabbatical rest. His end came on a midwinter day in 1875. The art of Millet is the true art of simple grandeur. It depicts a solemn, epic struggle - the conflict of Man with the earth from which he has sprung. His helplessness in the face of its cruelty, his adoration in the presence of its mystery. There is a grim humour to all this, the spectacle of Man struggling with his fate. A raw but rare genius, who influenced many other artists, including the American Winslow Homer, it is perhaps no wonder that Millet has been called "the Dante of the Yokels, the Michelangelo of the Clowns." Paintings by Jean-Francois Millet can be seen in the best art museums across the world.  For more biographies of great French artists, see Famous Painters.  For information about French painting, see: Homepage.